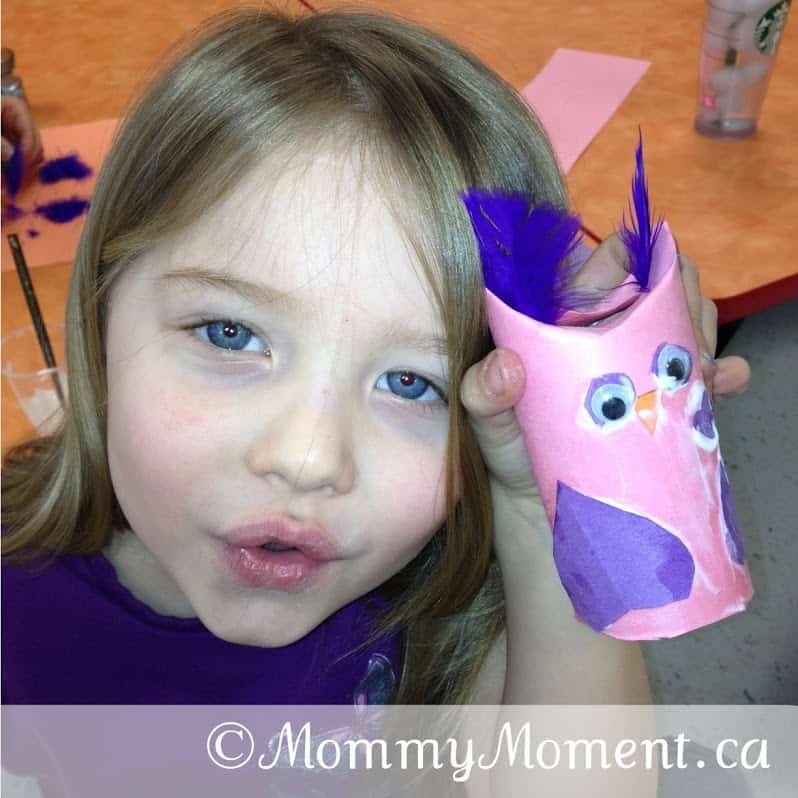 You are here: Home / Crafts / This Owl craft is a Hoot for Valentine’s Day! This Owl craft is a Hoot for Valentine’s Day! Every Wednesday morning I take my 4 year old daughter Jane to a French preschool program. Each week the children learn some new French vocabulary through play time, craft time and snack time. It has been a wonderful experience for Jane and I to attend together. This week Jane was the only child in attendance. She did not mind having some extra attention. 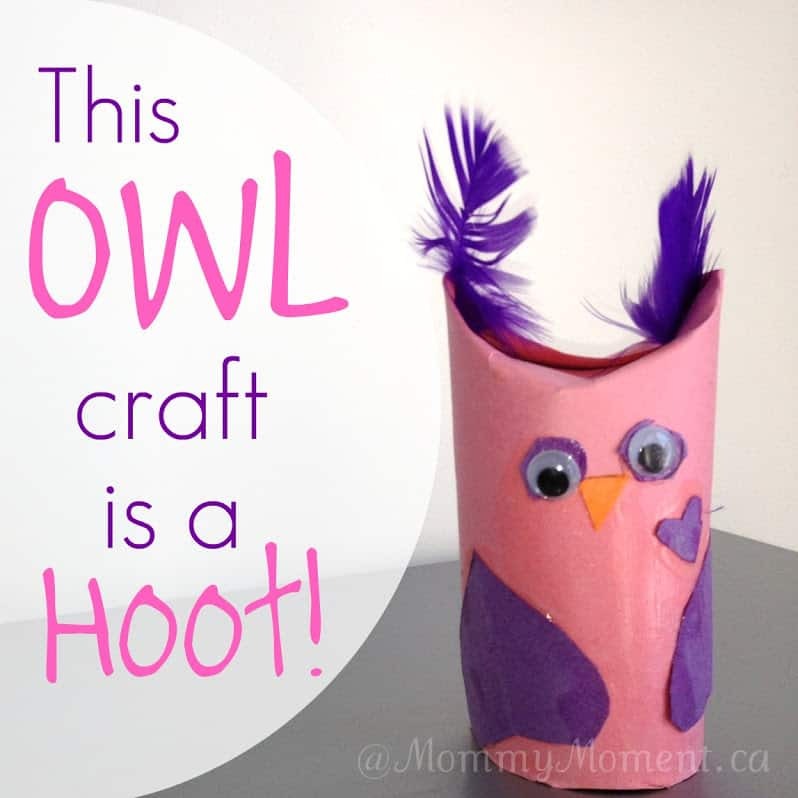 We made an adorable owl (hibou) craft that is perfect for Valentine’s Day. It was just too cute not to share! Put glue on the toilet paper roll, cover with pink construction paper. Cut out 2 hearts and glue upside-down on the sides as wings. Press in the top of the toilet paper to make ears. Cut out circles a little bit bigger then the googly eyes and glue both on. Add a little heart and some feathers for decoration. Smile at just how cute it is. Here is Jane “Hooting” with her new special Valentine friend before it is even dry! Have you made any fun Valentine’s day crafts with your children? I know, it was just too cute not to blog about. My 4 year old did all the cutting/gluing herself too which makes it that much more special! Thanks Ashley, I thought it was super cute too 🙂 Fun to make for the kids as well. Thanks for stopping by! These were so fun to put together.